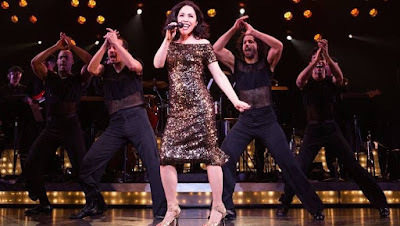 Carol's Theatre Reviews ~ It's Fun To Go Out: “On Your Feet”: A Brave New Musical Pulsing With Excitement and Energy. 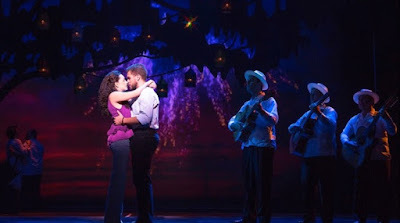 “On Your Feet”: A Brave New Musical Pulsing With Excitement and Energy. “On Your Feet”, the new musical filling seats at the Civic Theatre downtown through Aug. 5th, is about as energetic and crowd pleasing as any seen on this stage recently. To say it was love at first sight (“Here We Are”) might be an understatement but Dinelaris’ book (their true to life story) makes us wait a while as their rise to fame for the young Latin’s get to know each other. The story wiggles through business disagreements and his management and charge of her career, takes us back in time to their familial roots and shows us how the two made the crossover from Latin to mainstream outlets while not diluting or avoiding political controversies along the way by giving record executives lessons on the realities of the changing faces of America. 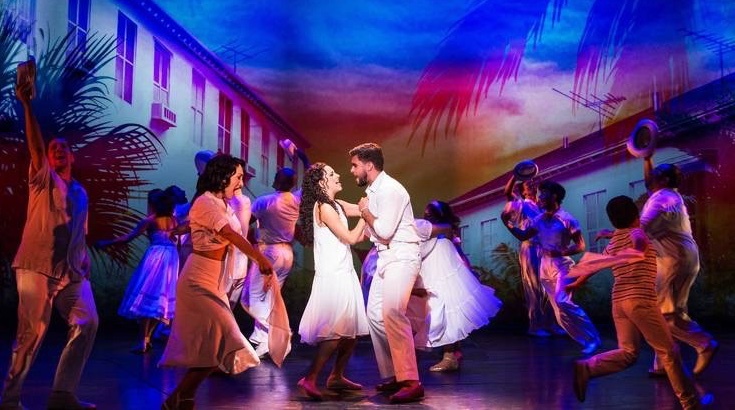 The action unfolds in Cuba on a less than successful note for their getting together when Gloria’s mother wants nothing to do with Emilio, his band or his promises. There was no love lost between the two until Gloria’s near fatal accident while on tour years later. Her reasons stem from the disappointments she experienced as an up and coming entertainer in Cuba when her husband, Gloria’s father (a solid Jason Martinez) an officer under the Batista regime after the revolution and was imprisoned by Castro. Finally freed from jail, they moved to Miami. He volunteered to go to Vietnam where he was exposed to Agent Orange and was later diagnosed with MS. All this was brought up when her mother finally confessed to her why she was so hard on Emilio. With an exceptionally talented cast of no less than twenty eight including dancers and band, leads Christie Prades, understudied for the part on Broadway and Mauricio Martinez, who performed in this role on Broadway, give credibly to the handsome couple with the dynamic that runs between. Both are attractive, energetic, and with more than just a hint of electricity as they dance, sing and settle in to their own narrative. Opening onto a busy stage (David Rockwell) we meet the young Gloria (excellent Carmen Sanchez) singing and sashaying with a laundry basket helping her mother, the elder Gloria (Nancy Nicotine who made her Broadway debut at age ten and hasn’t looked back since) and her Consuelo (Debra Cardona whose credits fill a quarter of a page) all with so much talent, it’s a jaw dropper. The show stealer is a young and treat of the evening Jordan Vergara taking on multiple kid’s roles (how about the Bar Mitzvah Boy?) with enough rhythm and energy to keep the lights on. Her catalogue of songs include “Anything For You”, “Don’t Wanna Lose You”, “Here We Are”, “Live For Loving You”, “Oye”, “When Someone Comes Into Your Life”, “Words Get In The Way”, “Come Out Of The Dark” that she sang on stage, returning to the spotlight after recovering from her horrific accident. And I was worried that I wouldn’t recognize any of the music all hits from the 1980’s (well I’m a dinosaur) but was so pleasantly surprised and blown away with the entire production and that included the eye popping costumes by Emilio Sosa, the snappy choreography not to mention the down to earth personal and rich story that brought a smile from ear to ear not seen in many other jukebox musicals. 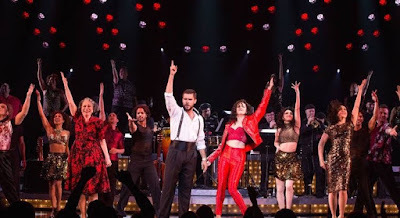 “Get On Your Feet” with the leads out front and the Miami Sound Machine in the background (on stage), the number that closed out the show must have gone on at least fifteen minutes while the entire audience was, in fact ‘on their feet’.